If you are looking for a design that is both girly and graphic, you will love Linked Circles & Diamonds Design. 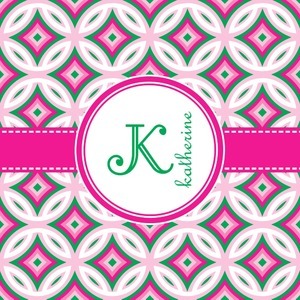 This design's color scheme is composed of light pink, hot pink, green and white. The pattern is exactly what the name implies circles and diamond intertwined through the whole design. Through the center there is label and ribbon shown in hot pink, but the color can be modified. Personalize the label with with your own name, a friend's or unique text of your own.